Looking down from the Notre Dame de la Garde on a hill above the city of Marseille, the downtown area and the Vieux Port can be seen clearly. This town is on the Bouches du Rhone region, on the Cote Bleue of the Mediterranean in Provence, France. The Notre Dame de la Garde is a Neo-Byzantine church, located high up on a hill at the highest point of Marseille, so when someone stands outside the church in the courtyard they can see all of Marseille spread out before them. The church is visible from all points of the city and it appears to be watching over everything from its vantage point. Photo of the city of Marseille and Vieux Port from Notre Dame de la Garde, Blue Coast, Mediterranean, Provence, France. Marseille is a popular tourist destination, and is also a popular place to enter and leave France because of the port, the airport and train station that connects it to the rest of Europe. 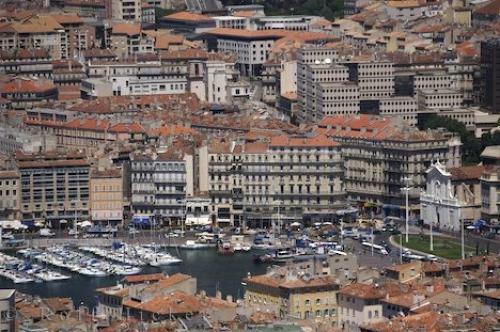 People have lived in Marseille for over 30,000 years and is the oldest city in France, dating back to about 600 BC. It is a fascinating place to go, full of hills and narrow roads, ancient buildings, community groups, churches and ships. Many films are also made here as it provides such an interesting backdrop. City of Marseille and Vieux Port seen from the Notre Dame de la Garde, ND de la Garde, Bouches du Rhone, Cote Bleue, Blue Coast, Mediterranean, Provence, France, Europe. I photographed this photo with the digital SLR camera model Canon EOS-1Ds Mark II, aperture of f/6.3, exposure time of 1/500 sec. on ISO 100, as always I used a original Canon Lens, the focus lenght for this picture was 285mm.